Thanks to Netflix Instant I’ve been on a bender lately with old Twilight Zone episodes. Such a good, classic show. It kind of bums me out that a show like Twilight Zone (or its ilk, The Outer Limits, The Ray Bradbury Show, &c.) wouldn’t really survive anymore–not in prime time at least. It’s been relegated to marathons and late nights on SyFy and Nick at Nite. But, it’s okay. Times are times. 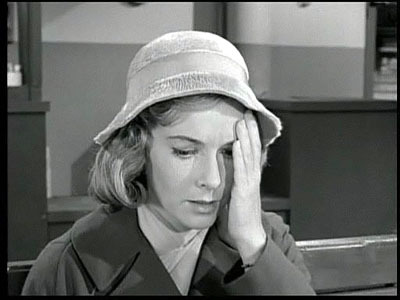 Anyway, the other day I watched the episode “Mirror Image,” in which Millicent Barnes wakes from a nap in a bus stop to all sorts of little classic TZ mindbender moments, culminating in seeing a double of herself and passing out in the arms of a nice man named Paul, who calls the police to have her committed for her ramblings about 2 planes of existence overlapping. Evidently, when this happens, the “you” from the other plane can cross over into yours, and to survive, must find a convenient way to dispose of you. It’s a little more malicious than the conceit of Angi Becker Steven’s story, “But You Don’t Really Care For Music, Do You?” but has a similar flavor. The morning my alternate-universe boyfriend appeared, I woke up to find him wandering our house like he was lost, confused. At first I thought he was sleep walking, even though he never had those tendencies’”I mean, the sudden onset of somnambulism made as much sense as any alternative. “What’s the matter?’ I asked him, and the way he looked at me, I could tell he was wide awake. My first impulse was to rush him to the hospital. I was trying to figure out how he could have gotten amnesia while I was naively asleep. Did he have some kind of stroke, an aneurysm, some kind of brain event? Did he fall out of bed and suffer a massive closed head injury while I slept soundly? I checked his forehead for bruises, lesions, but there were none. “What’s your name?’ I asked him. “Jared,’ he said, which was true. “What day is it?’ I asked. Then I didn’t know what to make of it. Could amnesia be that selective? All I really knew about it was what I’d seen in TV shows, which is the same thing as knowing nothing at all.